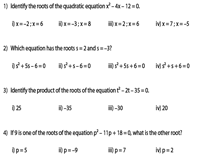 Employ this ensemble of worksheets to help learners identify the sum and product of the roots, find the missing root, forming quadratic equations with the given roots and much more. A few MCQ worksheets also have been incorporated here to gauge your understanding on the topic. A number of free printable worksheets are up for grabs! Use the various download options available to access all worksheets under this topic that provides for ample practice. Rewrite the given equations in standard form and identify the numerical coefficients a, b and c. Solve these worksheets to brush up on the fundamental concepts of quadratic equations. 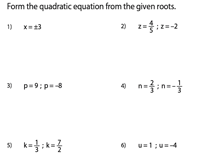 The quadratic equations are represented in standard form. 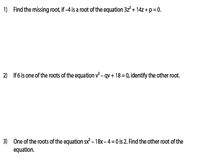 Determine the sum and product of the roots using the coefficients of the quadratic equation in this level of worksheets. Convert the given equation to standard form in this level of worksheets to find the sum and product of the roots. Use the answer key to verify your solutions. One of the roots is given. Either one of the coefficients or the constant is unknown in each quadratic equation. Substitute the given root in the sum of the root or product of the root formula to find the value of the unknown. Apply the appropriate formula to find the other root. The roots are given. Find the sum and product of the roots. Find the quadratic equation using the information derived. Write each quadratic equation in standard form (x2 - Sx + P = 0). Easy: The roots are integers and fractions; Moderate: The roots are real and complex numbers. 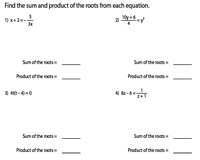 Test your knowledge on sum and product of the roots with this mixed series of MCQ worksheets. Identify the correct roots, sum of the roots, product of the roots, quadratic equation or standard form for each question presented here.